JERUSALEM: Prime Minister Benjamin Netanyahu sought to form a right-wing governing coalition yesterday after securing victory in a high-stakes Israeli election despite a strong challenge from a centrist alliance. The results from Tuesday’s vote came despite corruption allegations against the 69-year-old premier and kept him on course to become Israel’s longest-serving prime minister later this year. The allegations are likely to play an important role in coalition negotiations as many analysts expect Netanyahu to demand pledges from potential partners to agree to remain in his government if he is indicted. Netanyahu will rely in part on politicians of the nationalist right opposed to a Palestinian state to put together his government. His current government is already seen as the most right-wing in Israel’s history, and his next is expected to be similar if not even further to the right. Netanyahu himself, in a campaign pledge just three days before polling day, pledged to begin annexing settlements in the occupied West Bank. Applying sovereignty in the West Bank on a large scale could effectively end remaining hopes for a two-state solution with the Palestinians. Throughout the campaign, Netanyahu highlighted his bond with US President Donald Trump, who has swung US policy sharply in Israel’s favor and openly backed the prime minister. On Wednesday, Trump said the incumbent’s election to a fifth term gives the White House’s long-awaited peace plan, expected to be released in the coming weeks, a “better chance”. It was not clear what he meant. He also tweeted a picture of a Netanyahu supporter waving a Trump flag and telephoned the premier to offer congratulations. The election was seen as a referendum on the veteran prime minister, who has built a reputation as guarantor of Israel’s security and economic growth, but whose divisive right-wing populism and alleged corruption led to calls for change. The results reflected his deft political skills, Israel’s shift to the right and wide satisfaction with Netanyahu’s achievements, but also the fact that many voters are fed up with him. The new centrist Blue and White alliance put together by ex-military chief Benny Gantz will finish with a similar number of seats to the Likud even though it came together less than two months before the polls. Gantz’s alliance, which conceded defeat on Wednesday night, however could not peel away enough right-wing votes to unseat Netanyahu. The results showed that the Likud together with other right-wing parties allied to the prime minister would hold around 65 seats in the 120-seat parliament. Final official results are expected to be announced today. They leave President Reuven Rivlin, who must ask one of the candidates to form a government, with little choice but to pick Netanyahu. Intensive coalition negotiations could drag on for days or even weeks. Rivlin said he would begin consultations with party leaders next week ahead of making his decision. His office said the consultations would be broadcast live in their entirety for the first time. Gantz, a 59-year-old former paratrooper, mounted a strong challenge by brandishing his security credentials while pledging to undo damage he says Netanyahu has inflicted on the country with divisive politics. “We respect the decision of the people,” Gantz said Wednesday night. Former finance minister Yair Lapid, who co-led Blue and White, vowed to “make life bitter for the Netanyahu government”. The close race between the two main parties had led to uncertainty after polls closed Tuesday night and exit surveys were released. Both Netanyahu and Gantz claimed victory after the initial exit polls, though even then it appeared Netanyahu was best placed to form a coalition. 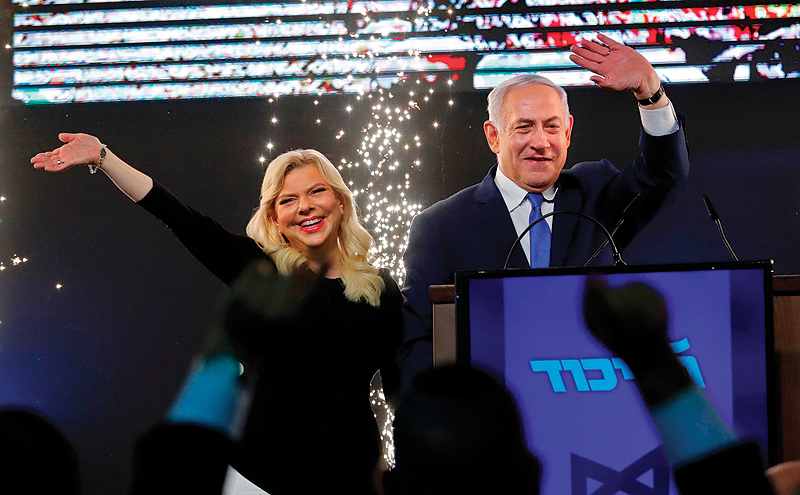 Speaking in the early hours of Wednesday at the Likud’s post-election party in Tel Aviv, Netanyahu called it a “magnificent victory.” The vote had been expected to be close as Netanyahu faced potential corruption charges.